The 282 properties, which are still under construction at the Citywest Quarter development just outside Dublin, have been put up for sale in one block by builder Cairn Homes. Selling homes to big funds which then rent them out en masse has become increasingly common in this country as the housing crisis continues to spiral. The narrative around such funds’ involvement in Irish property has largely focused on ‘vultures’, which have bought non-performing loans at a low price in the hope of making a quick profit. However, another type of investment fund has also emerged, focusing on long-term investments in Irish property by buying homes and renting them out for years. Critics of the practice say it deprives aspiring home-buyers of a chance to buy a home, in the way that cuckoos elbow fledgling birds from their nest. The proposed Cairn sale is the latest in a series of similar transactions. Last week, the country’s biggest landlord, a property investment company called Ires Reit, snapped up 118 family homes in the Dublin suburbs in a single deal from builder Glenveagh. The UN recently criticised the practice of selling homes to investors en masse. In a scathing assessment of the housing market, UN special rapporteur on the right to adequate housing Leilani Farha wrote to the Government, accusing it of facilitating the “financialisation of housing” through preferential tax laws and through weak tenant protections, among other measures. Ireland was one of five countries singled out by the UN. "Almost overnight, multinational private equity and asset management firms like Blackstone have become the biggest landlords in the world, purchasing thousands and thousands of units," the UN said. "They have changed the global housing landscape. Pouring unprecedented amounts of capital into housing, they have converted homes into financial instruments and investments." The UN said properties often deemed "undervalued" - which generally means affordable to those living there - are being purchased en masse, renovated and then offered at a higher rental rate, pricing tenants out of their own homes and communities. "Landlords have become faceless corporations wreaking havoc with tenants' right to security and contributing to the global housing crisis," the UN said. At Citywest, Cairn is looking to find an institutional buyer, and has put a guide price of €90m on the deal, equating to just under €320,000 each on average. 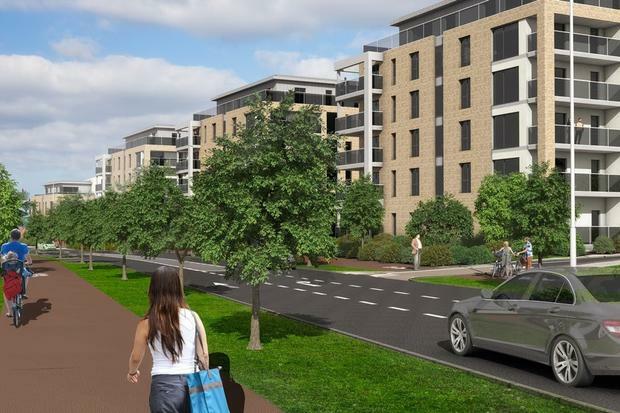 Apart from the 282 apartments, the Citywest Quarter will also contain around 170 separate units, which will be offered for sale to individuals. In the past decade thousands of homes have been bought by the new class of institutional landlords - including now familiar names like Ires Reit and Kennedy Wilson. In fact the transformation of the private rental sector appears to be only beginning. Property expert CBRE said last month that as much as €5bn is now targeting so-called build-to-rent (BTR) opportunities in Ireland's residential market. This sees the funds build properties with the idea of renting them out, potentially buying sites ahead of other developers who might give people the chance to buy. Kennedy Wilson's director of Irish operations Peter Collins has said his company wants to have 5,000 units let out here within four years. The company currently has just over 2,000 units built or subject to planning here. Meanwhile, another fund, Hines, is looking to build 1,269 BTR apartments in Cherrywood, Dublin. As for Ires Reit, it had almost 2,700 units let out as of the end of last year. Separately, State-owned AIB has pushed ahead with a €1bn sale of bad loans that controversially includes around 200 family home mortgages as well as thousands of buy-to-lets. The bank concluded the sale of so-called non-performing exposures to US fund Cerberus for around 80c in the euro. AIB, like all Irish lenders with big stocks of bad boom-era loans, is under pressure from European regulators to clean up its balance sheet fast. The portfolio consists of loans linked to 2,200 customers and 5,000 assets. The collateral is mainly buy-to-let and investment properties but includes some farm land. In around 10pc of cases the mortgage on borrowers' family homes is included because it "is cross-secured to wider commercial connected debt", AIB said.